One of London's most popular attractions, surrounded by multimillion pound properties and home to London Zoo, Regent's Park daily welcomes a colourful assortment of tourists, joggers and dog-walkers. With its 100 acres of public sports facilities, it also sees its fair share of recreational football players. But Londoners stumbled on an altogether more elite kick-about on a murky Wednesday morning as the royal park's pitches hosted a spectacle as exotic as many in the adjacent animal enclosures. German giants Borussia Dortmund - whose squad includes World Cup winner Mats Hummels - decided to prepare for their Champions League match against Arsenal with a "pre-warm-up" training session on turf distinctly less manicured than they are used to. 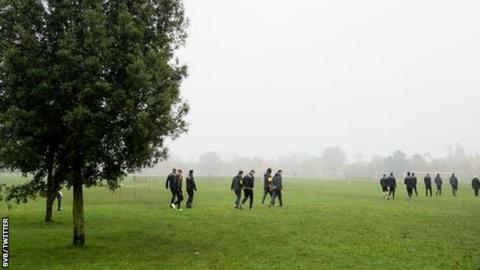 Pictures of the session - on a pitch more commonly used to host matches in the Camden and Regent's Park Sunday league - were posted by surprised onlookers on Twitter. Dortmund, who also posted photos, have already qualified for the Champions League last 16, but can secure top spot in Group D with a win at the Emirates. The German side have 12 points from four games, five more than second-placed Arsenal. They are two points off the bottom of the Bundesliga table after a poor start to their domestic campaign.